Aerial view of modern Juyongguan Pass. (40°17′18″N 116°04′07″E﻿ / ﻿40.2882°N 116.0686°E﻿ / 40.2882; 116.0686Coordinates: 40°17′18″N 116°04′07″E﻿ / ﻿40.2882°N 116.0686°E﻿ / 40.2882; 116.0686). Juyong Pass (Chinese: 居庸关; pinyin: Jūyōng guān) is a mountain pass located in the Changping District of Beijing Municipality, over 50 kilometers (31 mi) from central Beijing. The Great Wall of China passes through, and the Cloud Platform was built here in the year 1342. Juyongguan (pass) is in the 18-kilometer (11 mi)-long Guangou Valley. The pass is one of the three greatest mountain passes of the Great Wall of China. The other two are Jiayuguan and Shanhaiguan (passes). Juyongguan Pass has two 'sub-passes,' one at the valley's south and the other at the north. The southern one is called "Nan (pass)" and the northern is called "Badaling". The pass had many different names during former Chinese dynasties. However, the name "Juyongguan" was used by more than three dynasties. It was first used in the Qin Dynasty when Emperor Qinshihuang ordered the building of the Great Wall. Juyongguan pass was connected to the Great Wall in the Southern and Northern Dynasties era. The present pass route was built in the Ming Dynasty and received much renovation later. It was a very important strategic place connecting the inner land and the area near the northern border of China. It was also used to defend the ancient city of Beijing. Cloud Platform in Guangou Valley. Relief carvings in Cloud Platform portal. In the middle of the Juyongguan (pass) and Guangou Valley, there is the Cloud Platform gate, also known as the "Crossing Street Tower". It was built in 1342 during the Yuan Dynasty, and made of white marble with a height of 9.5 metres (31 ft). There were originally three white pagodas atop the platform, giving it the name of "Crossing Street Tower". They were each destroyed in the transitional period between the late Yuan and early Ming Dynasties. In the early Ming Dynasty, a Buddhist Tai'an Temple hall was built on the platform. It was destroyed in 1702 during the Qing Dynasty. In the middle of the platform's base there is an arched portal - where people, carts, horsemen, and palanquins could pass through. 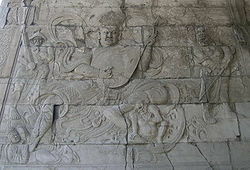 Many images of people and animals were carved inside the arched gate tunnel and around the portal. Wikimedia Commons has media related to Great Wall of China at Juyongguan. This page was last edited on 24 November 2018, at 20:42 (UTC).